WordPress is the world’s most popular content management system (CMS) for creating websites, blogs, and/or online shops. Today I’m going to talk about some ways you can optimize your WordPress website for SEO. Follow this SEO Cheat Sheet to make sure your website isn’t getting penalized without you even knowing it! First and foremost we need to make sure that your website is actually getting indexed by search engines. From your dashboard go to Settings –> Reading and next to the “search engine visibility” heading make sure that the “Discourage search engines from indexing this site box” is UNCHECKED. Often times during development, your web designer will check this box so your site doesn’t get indexed while it’s being designed/developed. If they forget to uncheck that box it could be hurting your search engine visibility. Head over to google.com/analytics and create an account. Even if you are unsure how to use Google analytics, installing it so it can start tracking your website pageviews and patterns is necessary. When you create an account, Google analytics will give you a tracking code that you can paste into your WordPress dashboard. Every theme is different — but yours may even have a spot to enter code within the body tag of your website. If it does, you can paste the code right into there and you’re all set. If you can’t find it, take a look at this article on WP Beginner for more information, or feel free to comment on this article and I can help you out. RSS (Rich Site Summary) is a format for delivering regularly changing web content. Many news-related sites, weblogs and other online publishers syndicate their content as an RSS Feed to whoever wants it. This allows people to read your website content through services like feedly. Your WordPress install, out of the box, is set up to generate these feeds. We want to make sure that you are only showing them in summary mode, though. So from your dashboard go to Settings –> Reading and next to the heading “For each article in a feed, show” make sure the radio button is checked next to “Summary”. Showing a full RSS feed to feed readers can be a problem because it makes it easier for others to steal your content. Also, if you are showing your entire article to someone using RSS, they will never click to your website. Using Summary mode entices those reading your RSS feed to click on the link and visit your website to view the whole article. Also make sure that your first paragraph or two is really interesting and relevant to your article to entice these readers to click! Breadcrumbs (also known as a “breadcrumb trail”) is a navigational aid that allows visitors to understand their current location in the context of a website. You’ve probably seen and used breadcrumbs hundreds of times before without even realizing it. Breadcrumbs gives visitors a hierarchical representation of where they are on the site. Adding breadcrumb navigation to your website will help to improve your website’s structure. A breadcrumb navigation also helps to improve something called “internal linking” which is important to SEO. To install breadcrumbs, I recommend the plugin YOAST SEO (we’ll be talking more about this plugin later). If you have Yoast installed, from your dashboard simply click SEO –> Advanced from your left navigation menu. On this page, under Enable breadcrumbs, click on “Enabled” to add them to your website. This article gives detailed instructions for adding breadcrumbs. Better Internal Link Search makes adding internal links to your website much easier. This is great for SEO. WP Super Cache helps to improve your page speed by producing static HTML files from all of your WordPress pages. These “cached” pages will load much faster than having to pull up a dynamic WordPress page. Sometimes your hosting company will install a caching system for you — if they do you are all set and don’t need this plugin. Fair warning: be careful when installing a caching plugin. Sometimes these can create errors with other custom code or having conflicts with your theme and other plugins. Make sure you back up your website before activating it. Yoast SEO is the most comprehensive SEO plugin available for WordPress and I highly recommend it. It lets you control many aspects of SEO like adding focus keywords, proper meta descriptions, and even analyzes how well your blog post or page is written. Another great feature is the ability to generate an XML sitemap that you can submit to Google Search Console and Bing Webmaster Tools in order for search engines to find your site more easily! Set your category, author, and archive pages to “noindex”. This helps you to avoid what is called “duplicate content” — multiple pages in your sitemap that are displaying the same information. Search engines don’t like this, so we need to turn it off! An excerpt in WordPress is a term used for article summary with a link to the whole entry. An excerpt can be auto generated by a WordPress theme or by using the <!--more--> tag inside the post content. Another way to create excerpts for a WordPress post is by entering the summary of an article in Excerpt field on Post Edit screen. This field is not displayed in the post edit screen by default. To enable it a user needs to click on Screen Options button on the top right corner of post edit screen and then enable it. Using excerpts ensures that the entire article is not displayed on your blog category pages. Users will get a quick summary and not have to scroll as much, and you will avoid having “duplicate content”. You should always use expressive URLS for your posts and pages, and make sure that you fill these expressive URLS with keywords from your page.This enables search engines to easy assign your content and also informs users of what to expect from the link. You can achieve this in WordPress by going to Settings –> Permalinks. Under “common settings” check the radio button next to “Post Name” to give your pages pretty urls rather than domain.com/cat47/pg69. It is not recommended to use the category within your permalink structure anymore. Although is seems like it would make sense, using the Post Name format is the way to go. Shorter URLs can be accessed more easily by the crawler and are better suited for shares on social networks. Note that changing the permalink structure on an already running website can BREAK your pages if you’ve linked to them throughout your website. Luckily, Yoast SEO built a really nice tool so you can do generate redirects of your pages. Make a note of your OLD permalink structure, then select it in the tool. When you click the generate redirect button. Once you get the code from this tool, you’ll have to add it to the top of your .htaccess file. If you don’t know how to access this file, contact me and I can put the redirect code in for you! Adding social media buttons on your pages helps to facilitate the sharing of your content on Facebook, Twitter, Pinterest, etc. You can add these buttons using a plugin like Share Buttons by AddThis. Make sure you check your theme settings — often times premium WordPress themes will come with social media sharing already integrated. 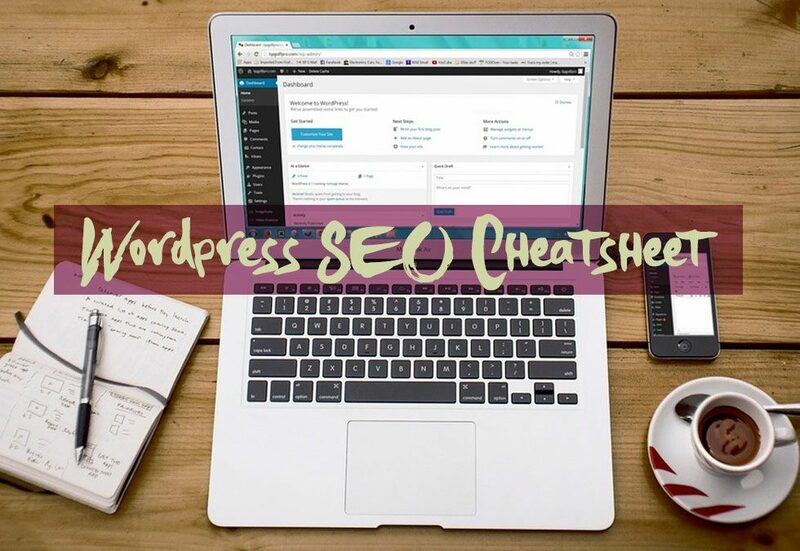 I hope you enjoyed my SEO Cheat Sheet and that it helps you to make actionable steps toward your search engine optimization right now! Today we learned about setting our WordPress site to be indexed by search engines. The biggest takeaway is to install the Yoast SEO plugin to help you with all of your SEO needs. Use this to generate a sitemap, write clear content and descriptions, and add breadcrumb navigation to your website. Don’t forget to add social media buttons to get your content shared! Do you have any more tips or tricks for SEO using WordPress? What’s your favorite plugin? Comment below with any questions or tips, I’d love to hear your thoughts.